The age of the Candidates age should be between 21 to 42 years.Age relaxation is admissible as per rules. General candidates have to pay Rs. 300/- and SC/ST/ Candidates Pay Rs. 150/-. Interested and Eligible candidates can apply online through the website http://www.sssc.uk.gov.in on or before 10/05/2018. Last Date For Receipt of Application: 10/05/2018. The age of the Candidates age should be between 21 to 28 years.Age relaxation is admissible as per rules. Candidates should have qualification in this Recruitment process they must have passed Graduate B.Sc. Interested and Eligible candidates can apply online through the website http://www.sssc.uk.gov.in on or before 30-12-2017. Last Date For Receipt of Application: 30-12-2017. Candidates should have qualification in this Recruitment process they must have passed Degree with Typing knowledge. Interested and Eligible candidates can apply online through the website http://www.sssc.uk.gov.in on or before 16-11-2017. Last Date For Receipt of Application: 16-11-2017. The age of the Candidates age should be between 21 to 42 years as on 01-07-2017.Age relaxation is admissible as per rules. Candidates should have qualification in this Recruitment process they must have passed Degree with B.Ed, Diploma. General candidates have to pay Rs. 300/- and SC/ST/ Candidates Pay Rs. 150/-through online by using Net Banking/ Debit/ Credit Cards/ E-Challan through Bank of Baroda & Net Banking. Interested and Eligible candidates can apply online through the website http://www.sssc.uk.gov.in on or before 12/11/2017. Last Date For Receipt of Application: 12/11/2017. Interested and Eligible candidates can apply online through the website http://www.sssc.uk.gov.in on or before 24-11-2017. Online Application form filling to begin from: 24-11-2017. Interested and Eligible candidates can apply online through the website http://www.sssc.uk.gov.in on or before 07/10/2017. Online Application form filling to begin from: 07/10/2017. Interested and Eligible candidates can apply online through the website http://www.sssc.uk.gov.in on or before 20-09-2017. The age of the Candidates age should be between 18 to 42 years as on last date of receipt of application, age limit relaxation will be given as per the Govt.rules. Candidates should have qualification in this Recruitment process they must have Passed 10th,12th, Degree,Please other details offical notification. Interested and Eligible candidates Can Apply Online Through The Website http://sssc.uk.gov.in/ on or before 02-03-2017. Candidates should have qualification in this Recruitment process they must have Passed High School, ITI, Inter, Any Degree, Typing Skill,Please other details offical notification. Interested and Eligible candidates Can Apply Online Through The Website http://sssc.uk.gov.in/ on or before 14-11-2016. Last Date For Submission Of Online Application: 14-11-2016. Interested and Eligible candidates Can Apply Online Through The Website www.uksssc.in in on or before 31-10-2016. Last Date For Submission Of Online Application: 31-10-2016. General and Comptroller within the Indian Constitution. Interested and Eligible candidates Can apply online website http://uk.gov.in/ on or before 30-09-2016. Last Date For Submission Of Online Application: 30-September-2016. The age of the Candidates age should be between 18/21 to 42 years as on 01 July 2016, age limit relaxation will be given as per the Govt.rules. Candidates should have qualification in this Recruitment process they must have Passed BDS. Candidates will be Selected on the basis of Written Exam and interrview. Interested and Eligible candidates Can apply online website http://www.ukmssb.org on or before 05-11-2016. Last Date of Submission online Application: 05-11-2016. The age of the Candidates age should be between 18/21 to 42 years, age limit relaxation will be given as per the Govt.rules. The age of the Candidates age should be between 18 to 42 years as on 01-07-2016, age limit relaxation will be given as per the Govt.rules. 2 Responses to "UKSSC. 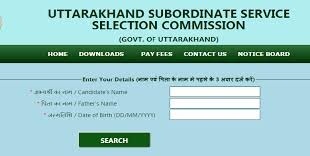 com | Uttarakhand SSC Recruitment 2018-19 Online Forest Guard – 1218 Posts"